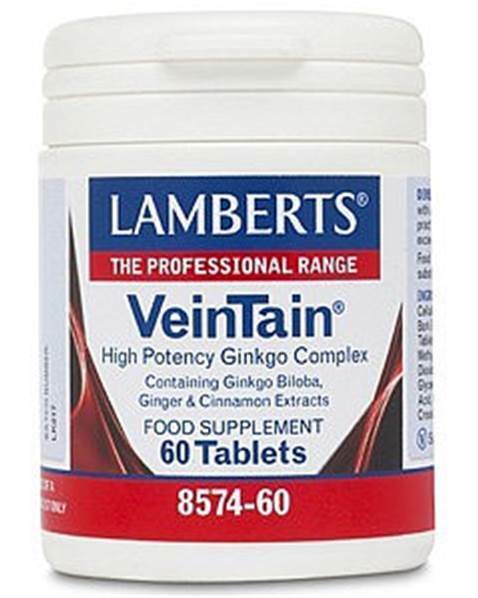 Lamberts VeinTain, Uses: Provides help for poor circulation - a full 6000mg (as 120mg extract) of the peripheral circulatory-boosting herb ginkgo, alongside both cinnamon and ginger. There are thought to be over 10 million sufferers of cold hands and feet in the UK (even in the summer months) with women being affected 9 times more than men, so a natural approach to helping peripheral circulation is welcomed by many practitioners. VeinTain provides a two pronged approach to helping peripheral circulation. Ginkgo biloba helps maintain blood flow to the extremities by encouraging the blood vessels to remain open. Lamberts VeinTain is a high strength product that provides the right potency of Ginkgo and the correct ratio of actives. Two capsules provide a full 6000mg (as 120mg extract) of ginkgo that studies have confirmed as an effective dose. The two spices, ginger and cinnamon, are thought to increase thermogenesis thereby stimulating body functions such as the circulation, and enhancing blood flow throughout the body. VeinTain contains both spices in extract form to ensure the active constituents are present. VeinTain has become the first choice by many practitioners for patients who have poor circulation as they have found that it gives a more reliable result than straight ginkgo. Modified Starch Cellulose Tablet Coating (Hydroxypropyl Methylcellulose Colours:Titanium Dioxide & Copper Chlorophyllin Glycerin) Silicon Dioxide Stearic Acid Magnesium Stearate.